Circus Cascadia offers a wide range of possibilities for after-school workshops! Learn to stilt walk, spin a diabolo, balance on a friend's shoulders, maybe do all of that at the same time! The sky is the limit! Each semester the term ends with a Circus Cascadia Show for friends and families. Want Circus Cascadia to come to your school? Our workshop model is ideally flexible to fit your needs, give us a call to find out more about what we can offer! ﻿﻿Circus Cascadia Class at Glencoe Elementary! show on June 3rd 2019. The Fee will be $155. After completing the google form and submitting payment you will receive a confirmation of your registration for Glencoe Classes. Please use this button below to pay for Glencoe Classes. Circus Cascadia Class at Woodstock Elementary! This Class will run on Friday's starting April 5th 2019 and ending with a show on May 31st 2019. The Fee will be $175. 9 Sessions this semester. Classes are held in the cafeteria.2.30-4pm. After completing the google form and submitting payment you will receive a confirmation of your registration for Woodstock Classes. Circus Cascadia Class at Creative Science School! This Class will run on Wednesday's starting April 3rd 2019 and ending with a show on May 29th 2019. The Fee will be $165. 9 Sessions this semester. Classes are held in the Gym 3.30-4.55pm. After completing the google form and submitting payment you will receive a confirmation of your registration for CSS Classes. The difficulty of writing about Circus Cascadia is how to accurately and completely describe how wonderful Paul & his team are. Our son signed up for the after school program with Circus Cascadia the first year it was offered at his school. Like any concerned parents we attended the earliest class that our work schedules would allow. We were blown away at how Paul took the complete chaos of over a dozen elementary school age kids and not only got their attention, but got them focused and listening to instruction. It only got better from there. We watched as our son who, like so many kids was shy speaking in front of a group was transformed. His circus experience taught him how to feel comfortable and confident in front of large groups. In addition to learning juggling and stilt walking he learned to unicycle. His comic timing improved and he grew into a person who not only felt comfortable performing, but began to take a leadership role within the class. Now as he prepares to head to high school, he volunteers with Circus Cascadia to teach younger students the skills that he has learned. I can think of no better endorsement of the Circus Cascadia program than the fact that a shy young boy has grown into a teenager who wants to spend his summer days helping the program. 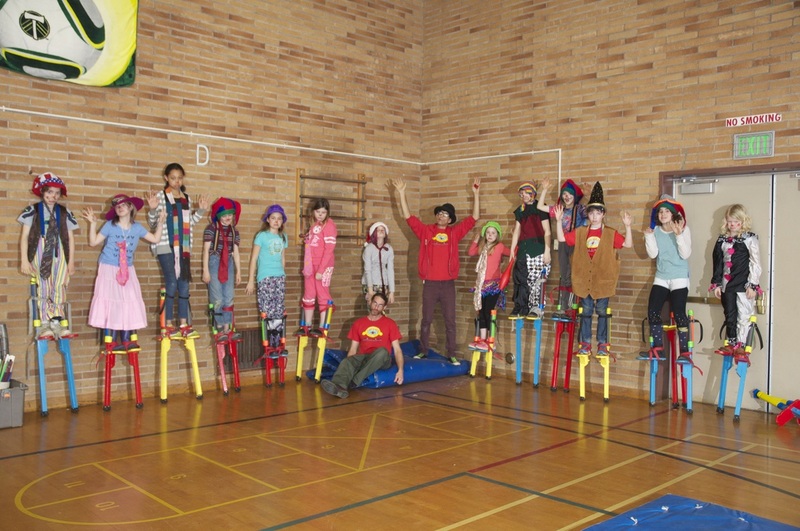 Circus Cascadia was a partner organization in our SUN program for the Spring 2015 nine-week session. Forty students participated in the circus classes, one class for Gr.1-2 and a second class for students Gr.3-5 (with many more on the wait list). The circus classes produced some of the best attendance records, demonstrating a particularly high level of engagement from students. The circus arts classes met the needs of students in our after school program – they provided hands-on activities and movement, self-discovery opportunities, appropriate levels of challenge and plenty of support and encouragement. The benefits of the Circus Cascadia programs at Arleta go beyond the after school program hours. This program encourages a high level of family engagement and boosts school morale. The students provided entertainment at two family events this term – the all-school family picnic and the SUN showcase. Whether toddler or adult, those who watched the circus kids in action enjoyed their time at the school and felt they were part of something special taking place at Arleta. Additionally, the kids wore their Circus Cascadia t-shirts with pride during the school day, and even several of the parents got their hands on adult sizes. Other parents offered support at home to students who were allowed to borrow unicycles for the week, and teachers commented on how “cool” it was that kids were encouraged to practice their skills at home. Today a family came in and commented on how wonderful the SUN program was this term. I asked the boy what his favorite class was, and without a hesitation he replied “CIRCUS! !” In particular, he commented on how the final circus show was one of the highlights of his year. He truly thought it was a special performance, as did so many other students and families.